PSALMS 37:5 KJV "Commit thy way unto the LORD; trust also in him; and he shall bring [it] to pass." 2For they shall soon be cut down like the grass, and wither as the green herb. 3Trust in the LORD, and do good; so shalt thou dwell in the land, and verily thou shalt be fed. 4Delight thyself also in the LORD; and he shall give thee the desires of thine heart. 5Commit thy way unto the LORD; trust also in him; and he shall bring it to pass. 6And he shall bring forth thy righteousness as the light, and thy judgment as the noonday. 7Rest in the LORD, and wait patiently for him: fret not thyself because of him who prospereth in his way, because of the man who bringeth wicked devices to pass. 8Cease from anger, and forsake wrath: fret not thyself in any wise to do evil. 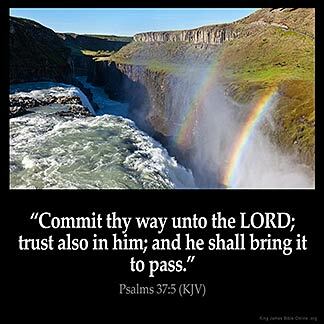 Commit thy way vnto the Lord: trust also in him, and he shall bring it to passe. Commit your way to the LORD, Trust also in Him, and He will do it. Commit thy way unto Jehovah; Trust also in him, and he will bring it to pass. Put your life in the hands of the Lord; have faith in him and he will do it. Commit thy way to the LORD; trust also in him; and he will bring it to pass. Commit thy way unto the LORD; trust also in Him, and He will bring it to pass. 37:5 Commit - All thy cares and business, and necessities, commend to God by fervent prayer. As long as I trust His word, I put my worries on Him and my trust that He will take care of them. Amen!